Description: Black bears occur in varied coat colours ranging from coal black to cinnamon, but all have a characteristically pale muzzle. Adult male black bears may weigh up to 220kg (485lbs) and reach shoulder heights of 1m (3.3ft). 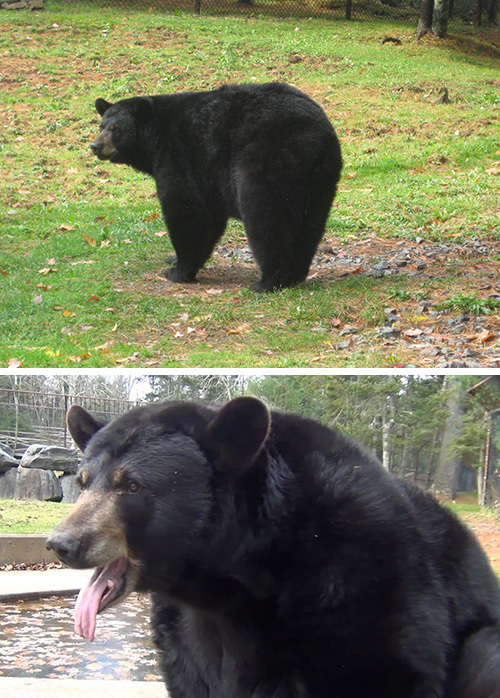 Female black bears are much smaller, reaching typical mature weights of 70kg (150lbs). Young black bears have disproportionately large ears that they grow into usually by 4-5 years of age. Distribution and Habitat: Found across all of Canada and the US, black bears are the smallest species of bear in North America. Typically solitary and shy, black bears prefer dense forest habitats but can be found nearly everywhere, having adapted to habitat loss and human interference. Black bears lack the ability to adequately regulate their body temperature in hot weather, so will dig shallow pits in muddy, wet areas (wallows) to roll and lounge in to keep cool. Diet: Omnivorous, the black bear diet consists of about 75% plant/vegetable matter and 25% animal matter. Black bears eat tremendous daily amounts of vegetation (fruits, nuts and berries), insects (ant larvae, bee larvae and grubs are favourites), small mammals, eggs, insects and carrion in order to amass the reserves of body fat that will sustain them through the winter months. Life Cycle: Predominantly solitary, black bears mate in early summer. After an initial period of growth, the resulting embryo(s) enters a quiescent state, resting in the female’s uterus until late fall, when her body will either permit the embryo to develop fully or will spontaneously abort. This decision is controlled by body condition; thin females will abort rather than use up valuable energy stores to grow a fetus. Black bears can mate every year, however cubs are usually born every second year in late January to early March. Typically, black bears give birth to 1 or 2 cubs, each weighing about 250g (0.6lbs). The young grow rapidly, weighing about 3kg (6.6lbs) at 6 weeks of age. Cubs emerge from the winter den at about 3 months and remain outside for increasingly longer periods of time as spring progresses. Young bears tend to stay with their mother for at least their first year. Not true hibernators, bears do experience body changes during their winter rest periods that are similar to hibernation: their body temperature may drop as low as 5 degrees Celsius (37 degrees Fahrenheit) and their breathing may decrease to 4-5 breaths per minute. However, black bears will wake up in the winter and leave their den for short periods of time, unlike animals that truly hibernate. Adaptations: Black bears have strong curved claws, used for climbing trees and ripping logs apart to search for food. They have a long, agile and sticky tongue for reaching into ant colonies and bee hives. Did you know? It is believed that black bears can see in colour, a characteristic that helps them find food like fruit and berries.